ACT Rural Fire Service Events: Our newest Australian Fire Service Medal recipients farewell event. Our newest Australian Fire Service Medal recipients farewell event. 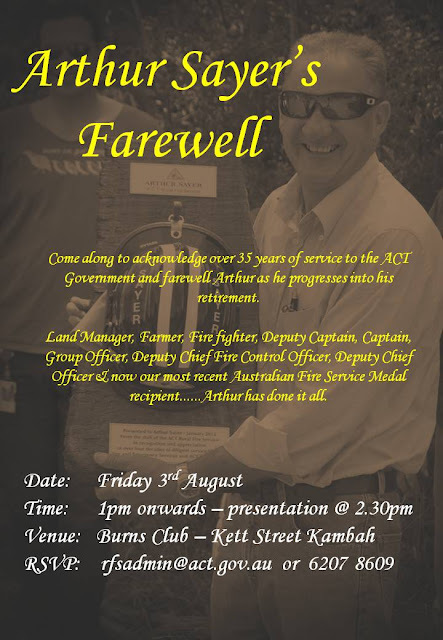 It isn't often that we get a chance to recognise one of our members who has dedicated over 35 years of his life to the protection of the ACT community from the threat of bushfires. We would love you to join us next Friday 3rd August from 1pm onwards at the Burns Club to farewell our most recent Australian Fire Service Medal recipient Arthur Sayer as he moves in to his retirment. Below is an extract written about Arthur as part of his AFSM Award. Mr Sayer has been involved in fire fighting in the ACT since 1978. During that time, he has progressed from being a fire fighter, Deputy Captain and Captain with the ACT Parks Conservation Service; a Captain, Group Officer and Deputy Chief Fire Control Officer with the ACT Bushfire Service; and Deputy Chief Officer for the ACT Rural Fire Service. He has been the Rural Liaison Officer for the ACT Rural Fire Service since 2007 and the Captain of the Tidbinbilla Rural Fire Brigade since 2008. Mr Sayer has been involved with the suppression of almost every major bush and grass fire in the ACT since 1985, and for most of these fires he has been appointed to a senior position within the command structure. He is renowned as both an excellent fire tactician and personnel manager during fire suppression operations, always making logical decisions and giving sound instructions to enable the fire to be kept to the smallest possible size. He constantly looks after the welfare and safety of the fire fighters and, for this and his fire fighting expertise, members of the ACT Rural Service hold him in the highest regard. In his current role as Rural Liaison Officer with the ACT Rural Fire Service, his primary function is to provide support and advice to the rural community on bushfire prevention, preparedness, response and recovery measures through the Farm Fire Wise program. Mr Sayer is passionate about this program and the people involved, freely sharing his extensive experience, knowledge and practical advice. This has helped to ensure that the rural community can perform an important role alongside the ACT's fire fighting resources, and has also ensured that the rural community has a reliable and supportive contact within the ACT Rural Fire Service. As the current Captain of the Tidbinbilla Rural Fire Brigade, Mr Sayer is responsible for overseeing the training and operational capabilities of the volunteer members. Through his relatively relaxed leadership style he has the ability to get the best out of these members without appearing authoritarian, and this is much appreciated by the volunteers.